These eight clean eating dinner recipes will brighten up any night of the week and are great if you're trying to lose weight. Exciting, the one time you get to spend at home in the kitchen making some real food, assuming you've been eating cold or reheated food through the day. It's time to wow the family, friends, partner or yourself with some healthy clean meals for dinner. Sometimes clean eating can be very boring, especially if you've been sticking to Chicken. Rice. Veg. Repeat. Let's make your new weight loss regime more enjoyable. Where do you start? Hopefully by now you've made yourself a weekly meal plan or you're in the process of doing so. We recently made a 5 steps to meal prep for beginners guide to help you do this and get your diet in check. Having a family to feed ourselves, we know how stressful dinner time can be so we've given you a head start with some of our favorite clean eating recipes to make your life that little bit easier at dinner time. Remember to double up and make extra for lunch tomorrow whether it's just the protein with a nice salad or the whole meal. 1. Chicken Fajita Stuffed Peppers. It's almost too healthy, a perfectly balanced meal with added beauty from the vibrant colours of bell peppers. Give this a try, we did and loved it. If you've been good most of the week feel free to add a little cheese to the top. Remember having something naughty now and then is okay in moderation. Vegetarian? Swap out the chicken for a meat substitute, chickpeas or extra beans. 2. Chilli lime chicken salad. It looks so yum! Imagine this with some rice or quinoa to give it a few extra carbs, unless you're going carbless tonight. It's a great combination of flavours, that said if you're not a fan of lime you might not enjoy this. 3. All in one steam roast salmon and broccoli with lime, ginger, garlic and Chilli. Onto some fish, salmon is my favourite and packed full of healthy omega oils. I love cooking it and this meal is all so simple. Perfect for when you need to just throw something in and wait for the oven to ping. Its great served with rice. 4. Grilled Lime Salmon with Avocado-Mango Salsa and Coconut Rice. Sticking with salmon, because it's so good for you. This is a perfectly balanced meal to keep you full and satisfied. It will go nicely into the tupperware for tomorrow's lunch as well. If you've ever had coconut rice you'll know how tasty this will be. Failing that just have some steamed rice and you'll still love this clean recipe. 5. Cajun Chicken with Coriander and Lime Rice. This is one of Luke's favorite clean meals, maybe because it looks so brightly coloured or it just tastes good. We held back on the lime rice but it was still so yummy. Cajun chicken with rice and roast vegetables, it's so simple when you strip it back. Adding the avocado and coriander just gives it that extra punch. If you're a Cajun chicken fan give this mix a go. 6. Sticky Beef with cashews. I wasn't a beef fan until I met Luke but now we try to have beef at least once a week, plus the kids quite enjoy it. Luke mad this Sticky beef recipe a little while back for us and now it's on our meal plan most weeks. It's full of flavour and I love cashew nuts which finish off the meal. It's also such a quick meal to make. We tend to have it with some rice and pour the extra juices from the pan over it. It's so good, you must try if you like beef. 7. Halloumi with lemony lentils, chickpeas & beets. Meatless Monday! Apparently it's a thing. I used to be a vegetarian and still don't actually eat that much meat I prefer fish. This is a good meal to give your tastebuds something different to experience. I know Halloumi is cheese but it's okay now and then and isn't too highly processed. The chickpeas and lentils combined with the cheese adds a nice serving of protein while the pulses also add a little carbohydrate to the meal. A really tasty meal. 8. Spicy Shrimp Burrito Bowls. Keturah and Claira from twosisterskitchens.com give us something special here. Spicy shrimp, sweet corn and bean salsa, rice and avocado. A great meal for any day of the week. With or without the rice this is a super clean meal that tastes great on those taste buds. If you're not a fan of prawns you can easily swap them out for some chicken or tofu. 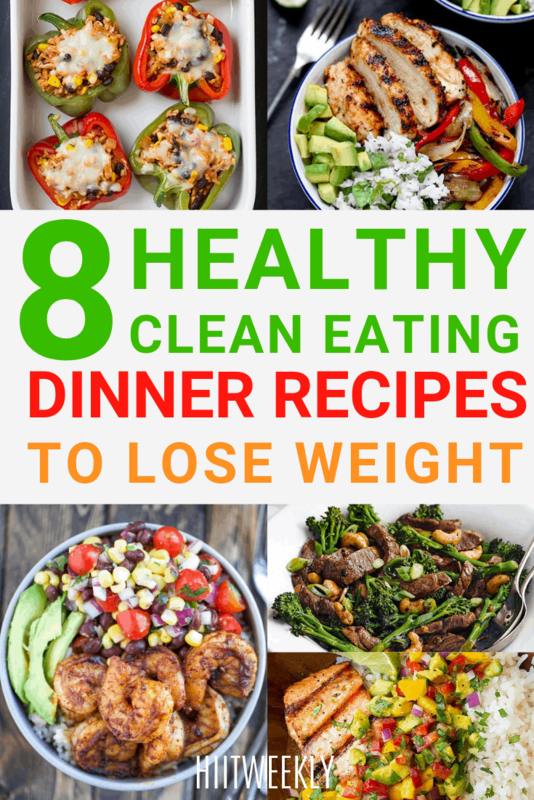 There you have it, 8 clean eating recipes for dinners. Try not to stress about what you eat. Have it planned out, write it down somewhere and enjoy the process of cooking and eating. Follow our clean eating board here for more clean eating recipes for dinner or lunch.